We have a new stock of Ulster National Flags. You can also show your solidarity with kinsfolk abroad and also defy the Alliance Party's would-be censors by hoisting a beautiful Confederate Battle Flag from your front porch. Only £7.00 each or £12.00 for one of each (or €10.00 or €16.00 for one of each in Éire). 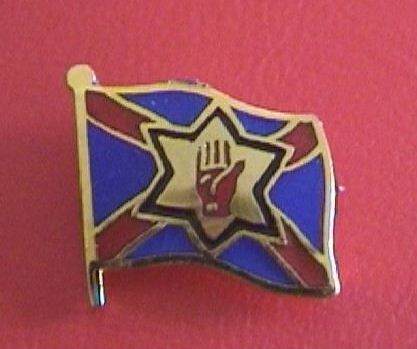 Discreet enamel Ulster National Flag badge, (12mm x 9mm). Available for £2.50 including post and packing in British postage stamps. North American customers are requested to send $5.00 in well-concealed cash. Customers in Éire and other European countries should send €4.00 in well-concealed cash. Ulster National Flag backed with Confederate Battle Flag. Ulster National Flag backed with Third National Confederate Flag. Ulster National Flag backed with Ulster map and Ulster First slogan. 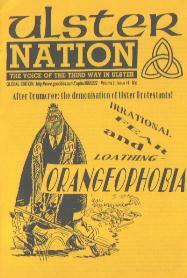 Ulster-Scots Red Hand and Thistle backed with crossed Ulster National and Confederate Battle Flags. Available for £1.50 each in British postage stamps or £5.00 for the complete set. 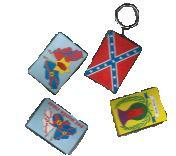 North American readers can send $3.00 in well-concealed cash or $10.00 for the complete set. Customers in Éire and other European countries should send €2.50 in well-concealed cash or €8.00 for the complete set. 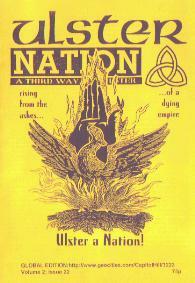 We have a limited number of Ulster Nation back issues still available. Once they're gone, they're gone! £1.50 each in stamps, €3.00 in coins taped securely to a piece of folded card inside an envelope or $2.00 in well-concealed cash. 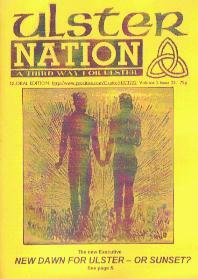 Five mixed issues (our choice) for £5.00, €10.00 or $10.00. Subscribe today. 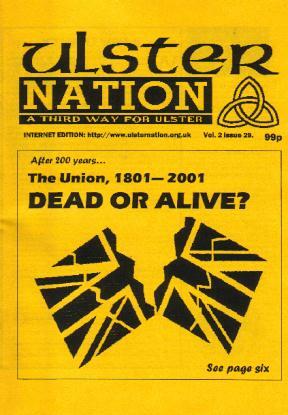 See the Ulster Nation Home Page for subscription details. 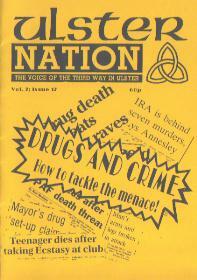 The Real McCoy is the first volume in our planned series of Northern Ireland politics booklets. These are designed to promote interest in all aspects of Ulster politics from an Ulster-nationalist perspective. 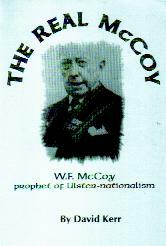 William Frederick McCoy was the unionist MP for South Tyrone in the old Northern Ireland Parliament. He caused uproar among the cosy Unionist Party establishment of the 1940s and early 1950s when he called for total legislative independence within the Empire - 'Dominion Status' - for Ulster. 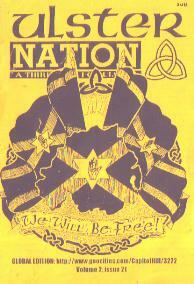 This new booklet from the editor of Ulster Nation tells his story. 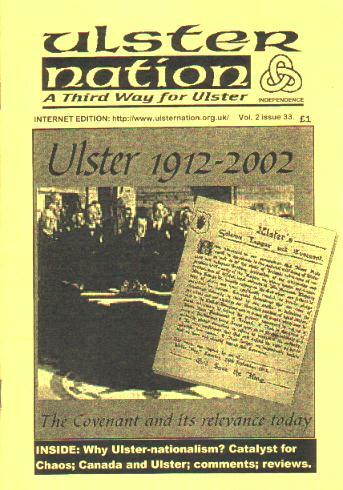 Copies are available for £2.50 in Ulster and Great Britain. 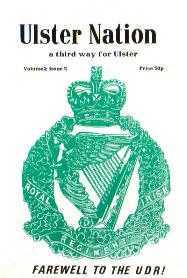 Please make cheques or Postal Orders payable to Ulster Fund. Copies in North America can be had via airmail by sending US$5.00 in well-concealed cash. Copies are also available from Amazon books. 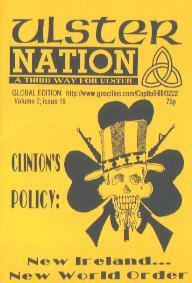 Third Way magazine - issue 32. 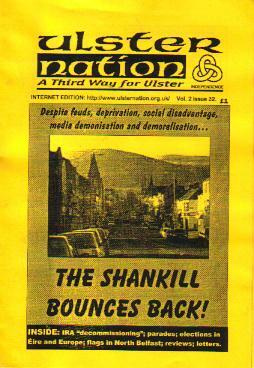 This new-look issue carries a long conversation with Rabbi Mayer Schiller when he visited Ulster during the Twelfth week of July 2000. 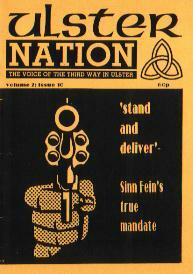 It also carries an update on Ulster's so-called 'peace process' from Ulster Nation's editor, David Kerr. There's a thoughtful look at the internet and its political uses and the role of elections for the Third Way movement. There's lots more in this excellent issue. Send £1.50 in stamps or US$3.00 in well-concealed cash for your copy.